50% of total rental payable within 7 working days of booking to hold reservation. Balance is due no less than 30 days prior to arrival. Some owners require balance sooner than 30 days especially during the holidays. You will be advised of any variation from the 30 day balance due. If your reservation is booked less than 30 days prior to arrival, the full amount of the rental will be due within 7 working days. 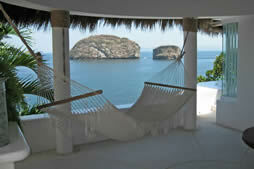 Cancellation between 60 and 120 days prior to arrival: 80% of deposit is refundable. Cancellation less than 60 days prior to arrival there is no refund unless the property is rebooked for the EXACT period in which case all monies received will be refunded less 20% administrative charge. Cancellation less than 30 days prior to arrival there is no refund. However, in the event Tango Rentals is able to re-rent the Property for the period cancelled a full refund will be made less a 20% administrative fee. 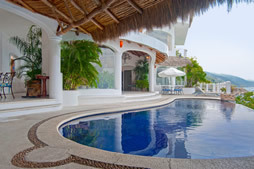 Cancellation of ANY RESERVATION OVER A HOLIDAY (Thanksgiving, Christmas, New Year's, Easter and Mexican Semana Santa) is non-refundable unless the property is rebooked for the EXACT period in which case all monies received will be refunded less 20% administrative charge. There will be no refunds due to acts of God, nature, weather or weather related situations, mechanical failure, earthquake, golf conditions etc. Cancellation for hurricane, earthquake or any natural disaster or any other non controllable situations such as but not limited to construction in the area, unusual noise or other disturbances are non-refundable. Please take out Trip Insurance. Please be advised that the cancelation policy listed above is typical to a majority of properties. However, some property owners may have more restrictive cancelation policies which would take priority over those listed here. If you have cancelation policy questions about a specific property, please contact us for more information prior to booking. 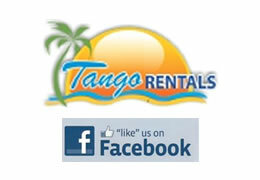 Neither Tango Rentals nor the property owner or any of their agents shall be held responsible for any injury, loss, illness or damage to any person or property of persons occupying any rental properties represented by the property owner or Tango Rentals. 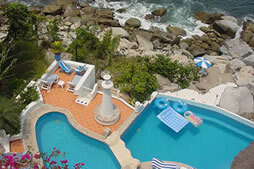 The rights, if any, of a person occupying the rental property to seek recourse against the property owner or Tango Rentals for any injury to the person or property of the person shall be governed by the laws of Mexico and determined exclusively by the courts of Mexico having proper jurisdiction. Neither Tango Rentals nor property owners shall under any circumstance be responsible for any disturbance or inconvenience to guest occupying its rental properties for the actions of its neighbors or the surrounding area. 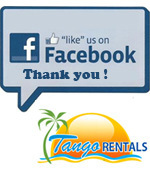 All information provided by Tango Rentals, while deemed true and reliable, is not guaranteed. Changes in inventory, items and decor may occur from time to time and such changes will not void or alter the terms of the rental agreement. 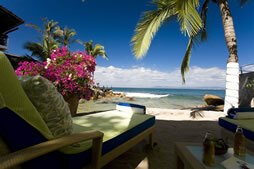 For your own protection, Tango Rentals strongly recommends that you purchase travel insurance. ALL foreigners entering into Mexico must have a valid passport. Birth certificates, formerly accepted, will no longer be accepted. If you have any questions, please contact your local Embassy, travel agent or airline representative.